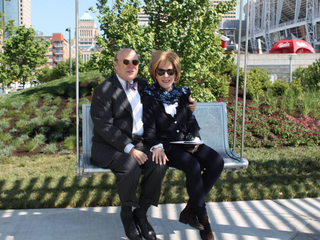 CINCINNATI -- The political feud over a seat on the Cincinnati Park Board came to an end on Wednesday, with Dianne Rosenberg losing the position she sued Mayor John Cranley to keep. It was uncertain whether Cranley could get the five votes he needed from Cincinnati City Council to replace Rosenberg with his ally and fiscal watchdog, Jim Goetz. But in a 5-2 vote, council approved Goetz to the park board, with David Mann, Amy Murray, Greg Landsman, Christopher Smitherman and Jeffrey Pastor voting yes. No votes came from council members Chris Seelbach and Tamaya Dennard. Councilman Wendell Young was absent and Councilman P.G. Sittenfeld said he abstained. "The rancor that has transpired … must be put behind us. We must focus on the future," said Cathy Caldemeyer, president of the Cincinnati Parks Foundation. But the nasty fight that began with allegations of political vendettas and country club spending may not be over. Sittenfeld said he has been contacted by descendants of those who left endowments to fund the parks, who are considering filing a lawsuit against the city "because of violation of donor intent." Those relatives worry the city will have veto power over how endowment money is spent, especially now that Rosenberg is off the board. As Sittenfeld and Cranley argued about the potential for yet another lawsuit against the city stemming from this fight, Dennard reminded council how few people actually care about this. "This issue is exactly what's wrong with City Hall," said Dennard, who noted she has spent 20 hours working on this issue and fielding lobbying efforts. "The amount of time that's been spent on this. This is just ridiculous." The fight started in December when Cranley first nominated Goetz -- a retired corporate financial officer who chairs the city's internal audit committee -- to the park board to replace Rosenberg. The outgoing city council approved him. But Rosenberg filed a lawsuit on Dec. 22 claiming that Cranley wrongly ousted her from the board because of a political vendetta. She supported Yvette Simpson in the mayoral race last year instead of him. "If she really tries to hold onto her position by working through city council, it will be a war and I will destroy her in the press," Cranley allegedly told attorney Jim Burke during a conversation in December, according to Burke's sworn deposition attached to Rosenberg's latest court filing. "I never said that. This has never been personal," said Cranley, who has been trying for years to reform how the park board spends its endowment money. In a 2017 audit, state officials recommended the city oversee how the park board spends its endowment funds. For example, the park board has spent endowment money on car allowances and legal fees, which the city opposes, according to court filings. "It's always been about transparency and implementing the reforms that came out of the audit," Cranley said in an earlier interview with WCPO. "Dianne has treated the endowment money like a private county club account and that has to change." But Rosenberg insisted the fight is really about a political grudge. "Ms. Rosenberg is being singled out for removal not because the law and the evidence require it, but because, according to the mayor's own words, she committed the unpardonable political sin of supporting the mayor's opponent," according to her court filings. On Jan. 23, both sides argued their case to Hamilton County Court of Common Pleas Judge Charles Kubicki Jr. In a ruling that both sides claimed as a ‘victory,' Kubicki nullified council's December 2017 vote for Goetz, saying the vote had to go before the newly elected city council. That left the door open for Rosenberg to keep her seat indefinitely. She could have theoretically stayed on the park board for years if a majority of council kept voting down potential replacements. "I think the majority of council is on record indicating that Dianne Rosenberg ought to remain in her seat," her attorney, Paul DeMarco, told reporters in the courtroom. But on Wednesday, Cranley found the votes he needed, with Landsman as the crucial fifth vote, to replace Rosenberg with Goetz on the park board. "He's eminently qualified … a man of great integrity," Cranley said of Goetz. "I think he's just what the doctor ordered."